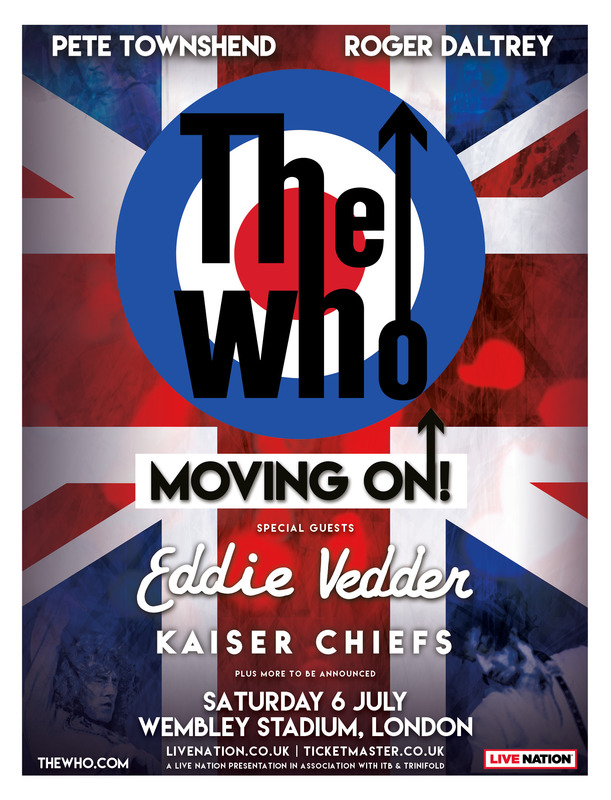 (LONDON, U.K. 28 January 2019) – Singer Roger Daltrey and guitarist and songwriter Pete Townshend today announce that they will be unleashing the combustible force that is The Who, with symphonic accompaniment this summer at London’s Wembley Stadium on Saturday 6 July 2019 with special guests Eddie Vedder and the Kaiser Chiefs. For early access to tickets, pre-order an exclusive limited signed edition of the band's soon to be announced new studio album at https://store.thewho.com/. Pre-sale starts from Wednesday 30th January at 10am.Tickets go on general sale on Friday 01 February 2019 at 10am at LiveNation.co.uk. The Who will also be releasing their first album of new songs in thirteen years later this year. On stage, the line-up will be rounded out by familiar Who players featuring guitarist/backup singer Simon Townshend, keyboardist Loren Gold, bassist Jon Button and drummer Zak Starkey. The Who are one of the top three greatest rock legacies in music history. Their music provoked explosive change and spanned what many critics declare is rock’s most elastic creative spectrum, with Pete Townshend’s songwriting moving between raw, prosaic, conceptual, and expressively literate. Their visionary sense of stagecraft headed by Roger Daltrey’s soaring vocal prowess is topped off by the band’s blistering rhythm section. With both Roger and Pete delivering their own memoirs in recent years (Pete’s Who I Am was released to much acclaim in 2012, and Roger’s autobiography, Thanks A Lot Mr. Kibblewhite; My Story, was embraced by critics in 2018) it’s fitting that the two remaining WHO members have shared their incredible legacy in literary fashion, for few bands have had a more lasting impact on the rock era and the reverberating pop culture than The Who.